I love my Kindle. It's the best thing ever. I can throw it into my big tote and take a library of books with me wherever I go. As a known introvert, one of my favorite activities is taking myself out to lunch with a good book. Before, when I got to the table and dug my Kindle out, I used to have to brush off all the crumbs and junk from my tote (I really should clean that out), then I'd have to figure out what to prop it on so I could read hands-free: the ketchup bottle, the sugar packet holder, maybe a napkin roll if the waiter left an extra one on the table. I needed an envelope case. And I needed a portable stand. I bet you do, too. Or maybe your mother does! This envelope case with a prop-up stand built right into the flap can be sewn to fit ANY tablet, and it's a quick afternoon project. 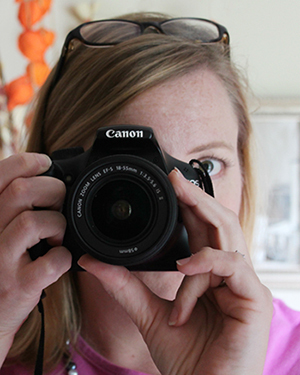 There are still a few days to whip one up for the tech-savvy mama in your life. If you’re like me and prefer to print out the tutorials you use, download the free 4-page PDF version here [you'll need a Craftsy account, but that's also free with an email]. Otherwise, read on for step-by-step directions how to sew your own custom-fit case. The cardboard that I use here was once the back of a drawing tablet and is just shy of ¼″ thick. Coordinating thread, appropriate needle for the fabric chosen, and if possible, a zipper foot. *See CUTTING for the amount of materials needed—the size of your tablet will dictate how much you need. I was able to use large scraps from previous projects. The remnant bin at your local fabric store would also be a great source of material for this project. The example numbers here fit my basic Kindle, 6″ display, with a leather cover attached. 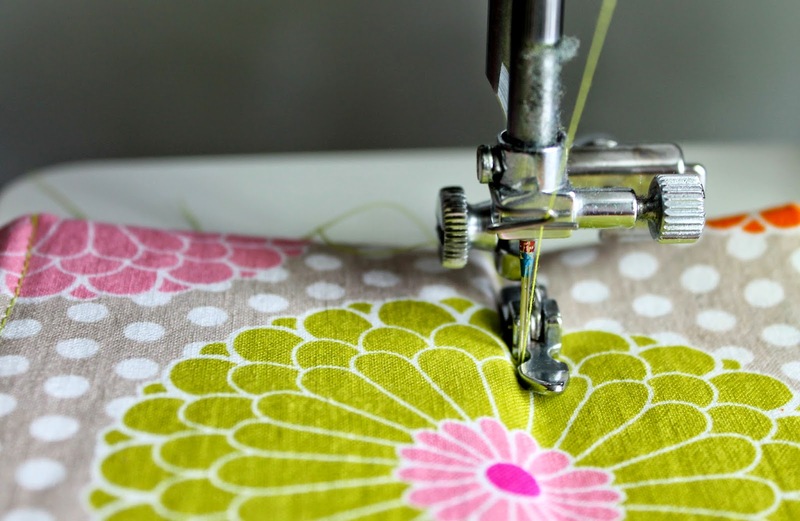 You will need to do your own Sewing Math based on your tablet’s measurements. I leave the leather cover on the Kindle while in the envelope case so I measured my Kindle with the cover on. You will need three accurate measurements: width, length, depth. I found placing the tablet on a table and measuring with a seam guide gave me the best measurement of depth. Measure accurately so that your final case fits properly. Using the dimensions you calculated above, cut one Shell Fabric, one Lining Fabric, and one piece of Interfacing. 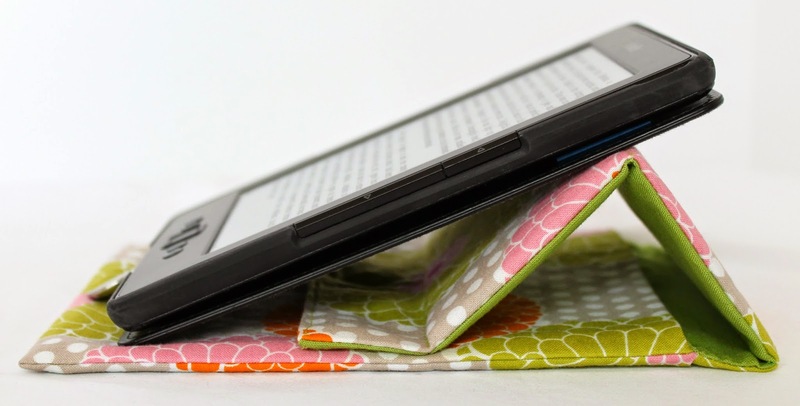 So for my Kindle in this example, I cut one of each 6″ wide by 22″ long. At this point, set the cardboard aside uncut—we could do the Sewing Math for that now, but it’ll be easier to do it when we’re ready for it. NOTE: I once had a professor of industrial design model making who loved the phrase “square to the world,” meaning model pieces cut to perfect measurements and angles. This is one project without a lot of wiggle room, therefore cutting “square to the world” is important. Mark twice, measure thrice, then cut and sew carefully. During my first attempt creating this case I didn't cut carefully and the case was just narrow enough that the Kindle wouldn't slide in. 1. Attach the interfacing to the wrong side of the Shell fabric. 2. 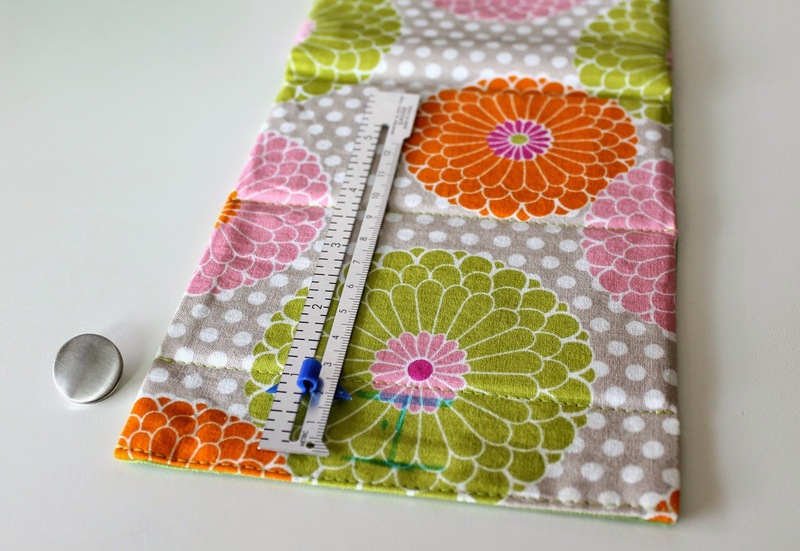 Calculate the length of your tablet plus your seam allowance (in my example: 6.75″ + .25″ = 7″). Measure from one short, raw end of the Shell fabric and mark a line parallel to the short end. Fold the fabric along the line of Step 2 and stitch the sides in place, backstitching or lock-stitching at the beginning and end of each stitch line. Press. Trim the corners at the folded edge. Step 2: Fold, stitch, and trim the corners. 3. Repeat Step 2 with the Lining fabric. 4. Turn the Shell fabric right side out. Place the Shell piece into the Lining piece, right sides together and align all seam allowances in the same direction (toward the outer edges of the flap. Starting at the top of the flap, sew down one long edge of the flap stopping with the needle in the fabric ¼” (or your desired seam-allowance) past the top edge of the pocket. [Quick tip: I find it helpful to mark the pivot point before I start sewing.] 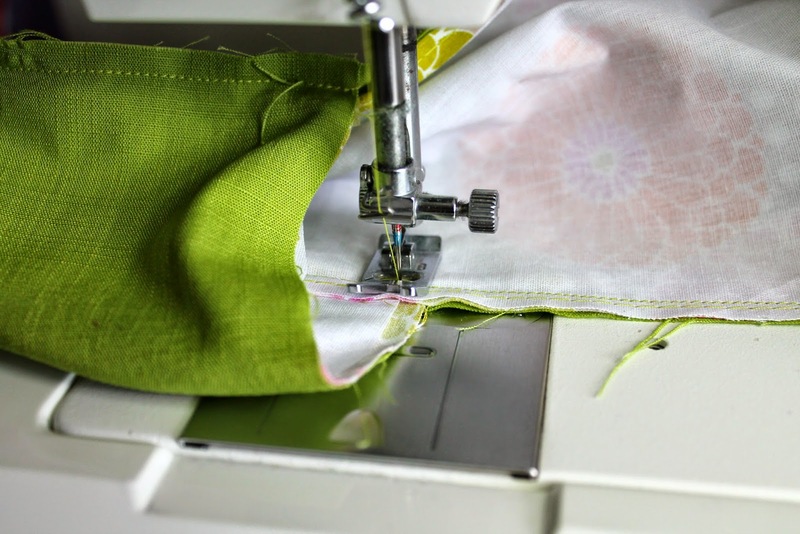 Lift the pressure foot and pivot the fabric to stitch across the top edge of the pocket, then lower the pressure foot and sew, stopping with the needle in the fabric ¼” (or your desired seam allowance) before the edge of the flap. Again lift the pressure foot and pivot the fabric to sew up the opposite long edge of the flap, then lower the pressure foot and stitch to the top. Do not sew across the top, raw edge of the flap. Being careful not to cut the stitches, snip into the corners at the pivot points, and trim away the seam allowance at an angle. Step 4: Join the Lining and the Shell fabric together along the side edges of the flap and across the top pocket edge. 5. Turn the case right side out with the Lining inside the Shell pocket. Press. 6. From the top of the pocket edge, measure and mark the depth of the tablet plus wiggle room (in this example .625″ + .125″ = .75″). Top stitch along this line from side to side of the flap—for a cleaner look, you may want to avoid back-stitching or lock-stitching at the beginning and end of the line, and instead pull threads through to the Lining side of the flap and tie off. Step 6: Mark and top-stitch across the flap. Now cut two pieces of cardboard to those measurements, in this example: 5.5″ x 2.5″. But wait! Don’t ruin your good scissors or rotary cutter, use a utility knife, an x-acto knife, or at least an old pair of scissors. 8. Slide one piece of cut cardboard into the open end of the flap until it is flush against the line of top-stitching from Step 6. 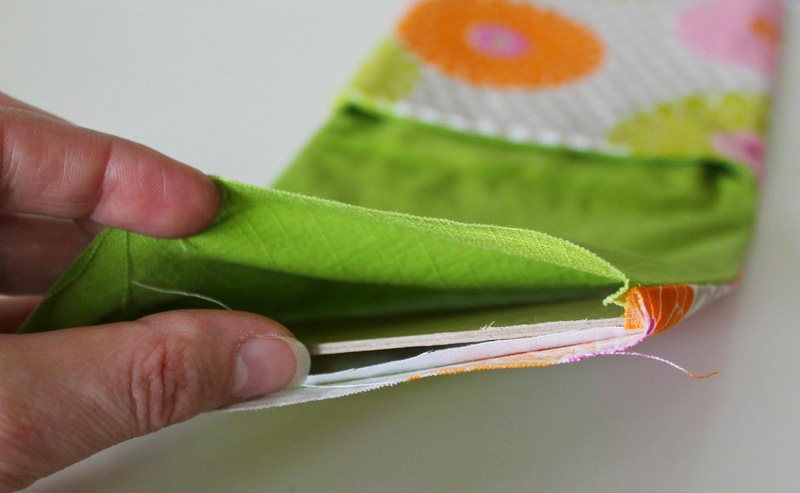 Using a zipper foot, top-stitch next to the cardboard—remember, you may want to avoid back-stitching or lock-stitching at the beginning and end of the line, and instead pull threads through to the Lining side of the flap and tie off. Step 8a: Slide one piece of cardboard into the flap until it is flush with the previous line of top-stitching. Step 8b: Top-stitch closely along the edge of the cardboard. 9. Slide the second piece of cardboard against the top-stitching from Step 8. Again, top-stitch next to the cardboard using a zipper foot and tie off your threads. 10. 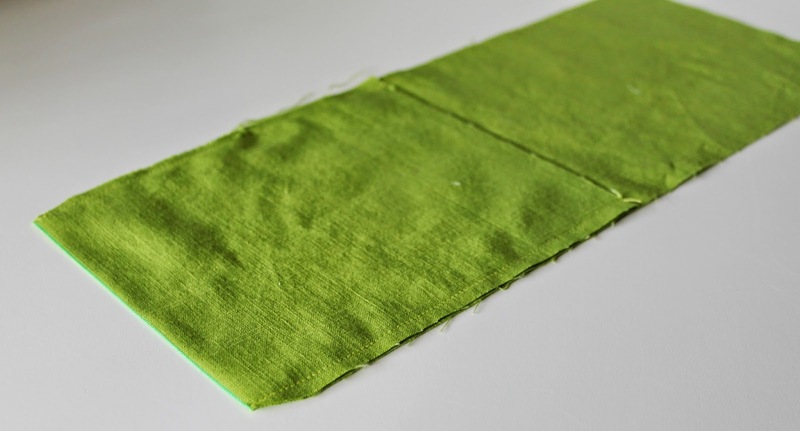 Fold in your seam allowance (here: ¼″) on the raw ends of the flap and press. Edge-stitch the short, top end of the flap closing the opening as you do so. 11. Find the center of the flap width and create a button hole to fit your button. It may be easier to create a button hole parallel to the short end, but I found a button hole parallel to the long side means less side-to-side wiggle for the flap when the case is closed. Step 11: Create a button hole centered on the flap. 12. Sew the button in place, being careful to stitch through the front panel of the pocket only. I love that this case protects my Kindle from banging around among the crumbs and detritus in my big tote and also gives me a safe place to easily prop it up when I’m out to lunch by myself. The button doubles as a stop that keeps the tablet from sliding down and I can adjust the height of the prop based on the glare in the room. You can easily look up any tablet’s dimensions on-line to make a quick, custom gift. Or just dive into your stash and sew for yourself like I did. Adjust the height of the prop depending on the light in the room and orient your tablet vertically or horizontally as needed. PS -- Thanks for reading to the end. Of course, now you need a bag to put your new Tablet Case in! 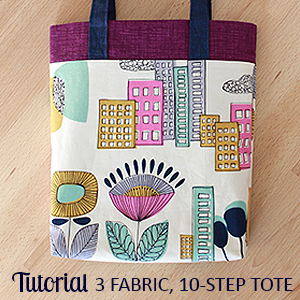 Try the 3-10 Tote or the Lined Canvas Tote sewn in coordinating fabric for a perfect set. From my model preferring to dance free rather than pose, to sewing myself into my dress while on the way to an event. Daily updates on Instagram (and Flickr) of works-in-progress will give you that behind the scenes view you’re looking for, and sneak peeks of First Tuesday Tutorials, too. That is very cool. I wish I had a kindle to make this for. Do you have another tablet? Like an iPad? It would work for any tablet! WOW! I've thought of incorporating cardboard to make a standing case for my tablet devices but never figured out how. 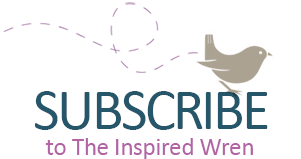 I'm totally digging your tutorial: pinning and bookmarking for sure! Thanks thanks thanks! It's super easy and fast. ...once you get past the sewing math. Super cute project! Love it! Thanks for sharing! great idea! I have a beanbag I put my tablet on when watching Netflix, but I could do with something like this, with less of an angle, for blog reading. thanks for sharing! YAY! Glad it fills a need. Thank you for this tutorial. 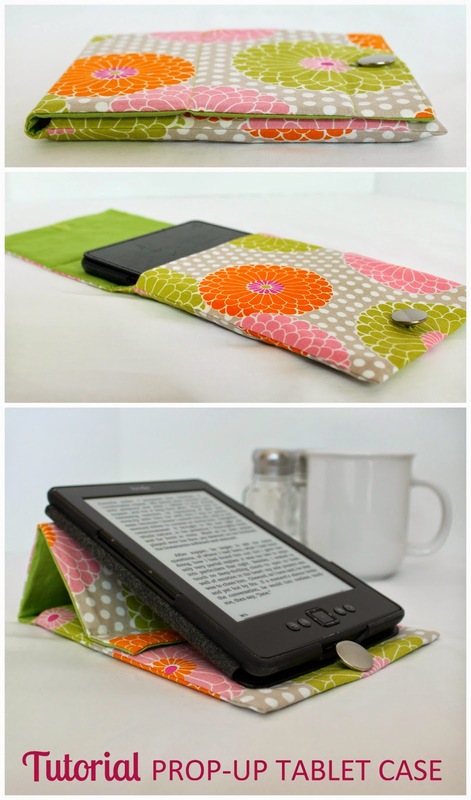 I certainly need one for my iPad that I use, just as you, to read while eating my lunch. I'll just have to make it slightly bigger. Thanks again! If you do it I'd love to see how it comes out. Wonderful tutorial! This is a great idea! 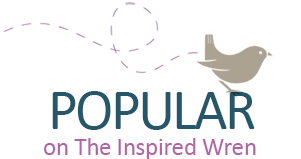 Thanks for linking up to Creative Spark Link Party. WOO HOO!!! Thank you so much. Ok I'm going to have to make about ten of these for all the devices in my close family - thank you for sharing this great tute! What a great tutorial! Thanks for all the pictures with step-by-step instructions! I'll have to try this out! Let me know if you have any questions, I'm happy to answer. What a great idea. I like how the cardboard props it up. 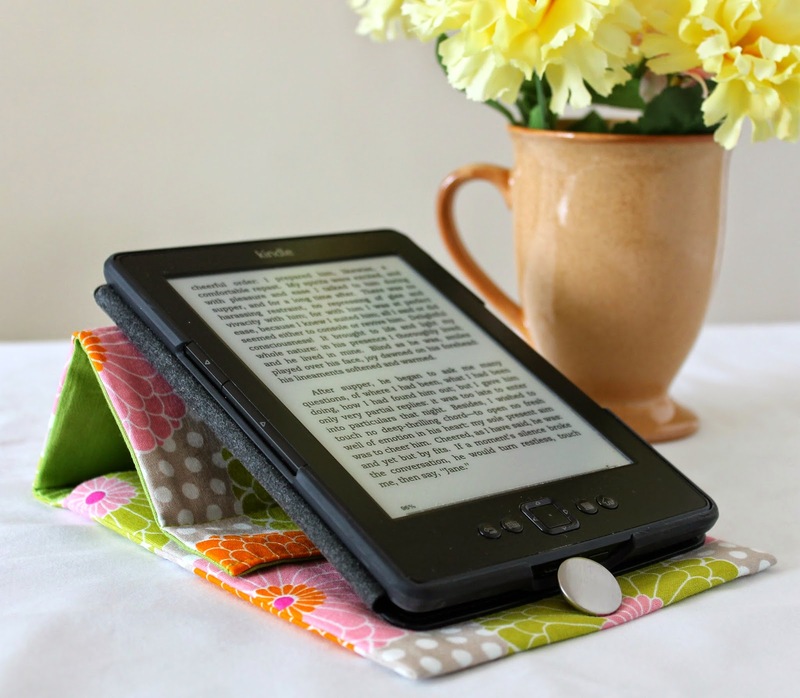 I made a case for my nook but it doesn't have that feature - might have to try out this idea - Thanks for sharing it - pinning. Thanks for the compliment and for pinning. Super cute and great tutorial. My husband made a simple cardboard one - but it would look so much prettier in fabric! Pinning! YAY YAY YAY! If you have any questions, please ask! I am an introvert too and love sitting at a restaurant with a good book! (not like that happens... Ever)... This is so cool! And handy! Such a great idea! I would love it if you joined and contribute your awesome posts at my link party at City of Creative Dreams on Fridays :D Hope to see you there at City of Creative Dreams Link Party. 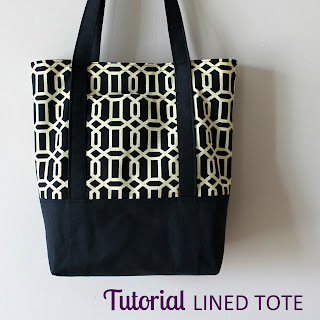 Great DIY - Thank you for linking up again with us at the #WWDParty. A great idea, Ren!!! Thanks for sharing the comprehensive tutorial. WOO HOO!!! Thank you so much! Thank you, My tablet is the nastiest thing on earth in my purse, little candy stained finger prints and I found a sucker end in the charge port once. So this will be the best I gift I make for myself and it looks super easy and i have all the supplies right now on hand. Excellent! I'd love to see how it comes out. This is just adorable! Great instructions and awesome design! Great idea, I need one for my tablet, Thanks for sharing. The fabric jumped into my cart one day when I wasn't expecting it. Funny how that happens. Thanks so much for tutorial have downloaded it for my next project. Excellent! If you have any questions let me know. And when it's done share it in the Flickr group -- I'd love to see it, and someone has to be the first to upload to the group, might as well be you. 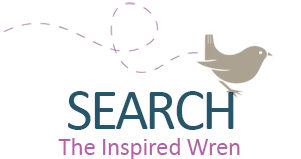 What a lovely project, and a very clear tutorial too, thanks for sharing. Ooh. I love this case. I just got an iPad last month so I might have to pull out my sewing machine and test this out. I'd be thrilled if you'd link up at this week's Off the Hook! Excellent. Thanks so much. I linked up! Darling!!! What a great idea! WOO HOO!!! Thanks thanks thanks! I've added the featured button to my Groups & Parties page. Totally awesome tute and love the case! I discovered the other day that even being super careful, I still don't cut square and if you follow those crooked lines....you sew crooked....but i would still be willing to try this project! Apparently I can't either. The first time I made this case it was too narrow at the opening. I THOUGHT it was because I had the math wrong. So I re-calculated and did it again. The second case was too large. Went back and realized my math was correct but my cutting was off. Third time was the charm for me. What cute cute case and great idea! Thanks for linking it up to Think Tank Thursday. I featured you today! Woo hoo! !Thanks for the feature! Great idea! First I saw it on Craftgawker and I loved the design. I should have known it was you :) So well-made. It is very practical and I believe it will be a great weekend project. What I love the most is that it can be adapted to any mobile device! Thanks so much. Thanks for hosting. Just stunning! Love it! Thanks for sharing! Brilliant! ...and cute! Pinning to the Monday Funday board! Thanks, Katie! And thanks for pinning, too. What a great case! Thanks for the tutorial. 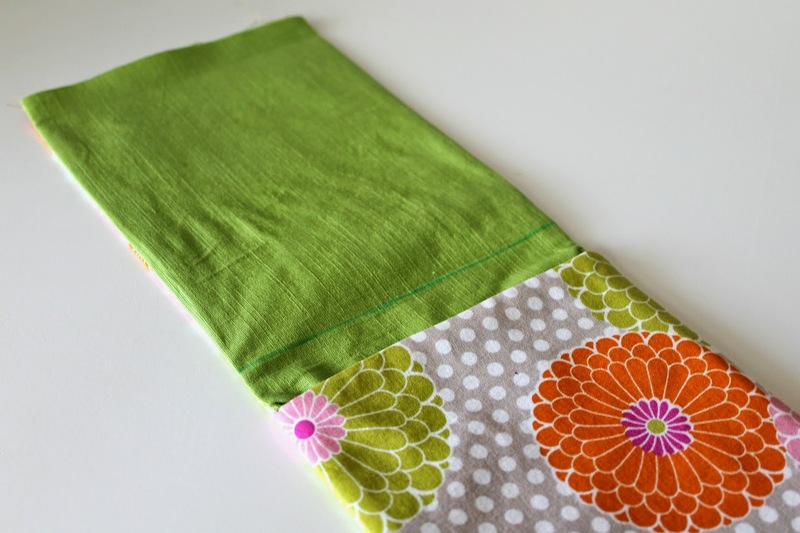 Also, thanks for linking up with Tuesday Sews at PiePie Designs! Thanks, Lisa. And thanks for hosting! Love this idea! Thanks so much for sharing on the Monday Funday link party! Thanks, Pauline! And thanks for hosting the link party. I love this idea! Although it has been a long time ago when I had to figure sooo much math! LOL! I am wondering if you could make this and instead of using cardboard, use plastic canvas plastic or some other thin plastic so it could be washed? I am a Mom and Mimi so I immediately think of it getting dirty easily if you are propping it up/sitting it down on Fast Food tables or other places as well as just from handling it. After going to all the trouble of making this beautiful case I would want mine washable. So of course that would require preshrinking your fabrics of choice as well. Would be awful to wash it and it shrink and not fit! Great point, about making it washable. Especially as it bangs around inside my yet-to-be-cleaned-out tote. I tried to use a really thick/heavy interface (one that I had used to make a back pack) and found it wasn't stiff enough. I wonder if that plastic canvas -- especially the kind you give to kids to practice cross-stitch with yarn -- would be stiff enough *and* survive a washing machine. I think it's a great idea. Oh, thanks for the PDF version as well! In case I don't want to carry the laptop around to read all the instructions. No problem! I print out every tutorial and pattern I follow/use. I'm not a fan of just printing out a blog. I always figure if one person wants it/asks for it, there are probably others thinking of/looking for the same. This is awesome, I have a nook simple touch at work without a case at all, (my other two are at home with cases), I can't wait to make this for that one. It'll avoid the little scratches that can occur in my desk. Thanks so much, Lara! I'd love to see your case when you're finished, be sure to share. Thanks for the compliments. It could only go a tiny bit higher than depicted here. I have an idea for a stand-case (instead of just a prop), but I haven't even tested it yet. The instructions were easy to follow and I saw the comment about adding mesh plastic too late - would like to try another with plastic so it can be easily washed. You know, I've since taken a better look at the kind of plastic I was thinking about and I don't know if it would be strong enough. Maybe two layers of it? Someone really needs to test that for all of us. Thanks so much! I strive for attention to detail, it's nice that you noticed. This is great! Love the fabric you selected. Thanks so much! I had another fabric from my stash on hand that I planned to use for this ...and then I went to the store and saw this one and couldn't help myself, it was too perfect. Someone may have mentioned it but I will be making the horizontal version of this for my tablet. Great for watching movies, YouTubes, etc. Thank you so much for this. You are awesome! That's brilliant! I'd love to see it when you're done. Thank you so much. I am just about finished with my version - have to add the buttonhole and button then I'm done! Great tutorial! I created an Excel spreadsheet to make the math "easier". Now I can just plug in the dimensions for any future tablet and get the results easily. Wow! It looks like it took some time and effort to figure this out but well worth it! How great to be able to have a customized case. Thanks for sharing instructions in such great detail. Wow, this is so great. Glad i found this tutorial. 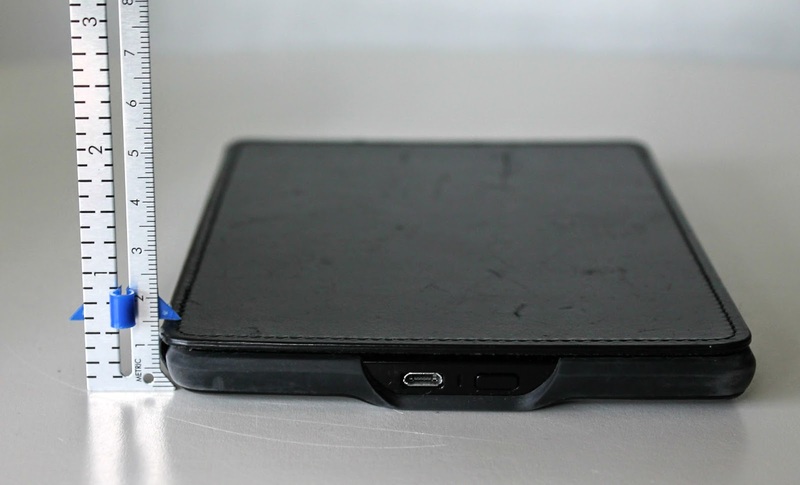 Thanks for sharing this prop up tablet case tutorial. It was quite helpful but i liked the fintie cases!